There’s the Governor, Captain Arthur Phillip, twenty officials and their servants, 213 marines with some wives and children, more than 750 convicts – one chaplain and his wife – as well as one eternal optimist – a certain James Smith, the man who had actually stowed away on the First Fleet! The Fleet has taken 36 weeks to reach Botany Bay – and they arrive just four days before the two French frigates commanded by la Perouse also turn up – and after a few more days they transfer the site of the new colony to Farm Cove in Port Jackson on January 26. And so, just over a week later, on Sunday February 3rd, the assembled crowd stands under a great tree, just a few dozen yards from the shore, as the chaplain opens the Word of God. We would do well to ask that same question. Why? Most of us didn’t learn anything about Richard Johnson in Australian history lessons… he rarely figures at all. As we’ll see, he is a man very much after our own heart, and from whom we can learn a great deal. Another reason is that the reactions of two key men in the colony to the gospel preached by Johnson illustrates our responses – and those of our friends – to the gospel today. And lastly, we need to think about what we might render to the Lord for what he has done for us. But why would anyone volunteer to come as Chaplain on a fleet of convicts to sail to the end of the world? There was tremendous excitement in England after the discoveries of Captain James Cook in 1770. There was much talk about sending an expedition to Botany Bay – and the news that a Colony was going to be established fired the imagination of many people… including men like John Newton, the ex-slave trader who had written the hymn “Amazing Grace” after his turning to Christ. John Newton was a leading gospel minister and the main figure in a group of evangelical clergy and laymen called The Eclectic Society. It was founded in 1783. They discussed how they could further the cause of the gospel at Botany Bay – and became interested in the choice of a Chaplain to sail with the First Fleet. A minister who should go to Botany Bay without a call from the Lord and without receiving from Him an apostolical spirit, the spirit of a missionary, enabling him to forsake all, to give up all, to put himself into the Lord’s hands, to sink or swim, had better run his head against a stone wall. Yes – the man to be the Chaplain for Botany Bay must not be the stereotypical English country clergyman with interests in nothing more challenging than cake stalls and model railways! John Newton and his friends knew that they needed a gospel man. A man called by God. John Newton was a friend of William Wilberforce (the evangelical Christian man who had worked hard to abolish slavery) and Wilberforce was the closest friend of the newly-elected 25 year-old British Prime Minister, William Pitt. Through Wilberforce, they suggested to the Prime Minister a name – that of a 31 year old Yorkshireman – the Rev Richard Johnson. As a result, in October 1786, Johnson received a royal warrant as Chaplain to the Colony of New South Wales. Richard Johnson had studied at Cambridge from 1780 and he was ordained in 1783, after coming under the teaching of sound evangelical preachers. He was appointed to a rural parish in Hampshire – and the next we know of him is his appointment as the Chaplain. We also know that he had spent some time in farming – and this was to prove very useful when he came to New South Wales. He was married to Mary Burton a month after his appointment and just five months before the First Fleet sailed from Portsmouth. The Fleet left in May 1787, with Richard and Mary Johnson on board the ship The Golden Grove. The convicts had already been aboard the ships for 4 months or more even before they sailed. On The Golden Grove he was able to conduct a service each Sunday, and to read prayers every evening. When the Fleet reached Rio de Janeiro, he visited the other ships to minister to those on board, marines and convicts alike. Richard Johnson was a man with a mission. Not for him any pious platitudes… he was concerned vitally about the souls of men and women. After their arrival at Port Jackson, Johnson was as busy as anyone in the new colony. It took five months before he was able to house his wife in a little cottage built from cabbage tree palms and thatched rushes – and by the end of 1788, he was growing enough vegetables for his own needs. He soon became known as the best farmer in Sydney Town. In three years, he and Mary and their new born daughter moved into a new brick house in Bridge Street, not far from the Tank Stream… and a son was born a year later. But much more importantly than those housekeeping matters, was Richard Johnson’s burning desire to preach the gospel of Jesus Christ and to see men and women won to him. He saw the need around him every day. He baptised, he married, he buried. It was his task to be present with those who were to be executed and he prayed with them on the scaffold. He held services of worship every Sunday in the open air or sometimes in a large store. By the end of 1790, he had begun to hold regular services for the settlers at Parramatta – and the following year he also began travelling to minister to the convict community at Toongabbie. Some histories – written by unsympathetic historians – portray him as a quaint preacher who confined himself to preaching on the evils of swearing… but that is a terrible misrepresentation. No – Richard Johnson was an evangelical minister. He was a man who was convinced that the Bible is the true Word of God, and that repentance and trust in Jesus Christ are the only way to be saved. His concern was to accurately teach God’s Word. So, with great love and affection – as well as with great urgency, he called on men and women, marines and convicts alike, to turn to Christ. But, as we know, Johnson did. In our day and age, there are many who want the church to be some kind of stabilising moral or social influence. They want us to be in the community helping people… cleaning them up and making them into good citizens. But when we preach the gospel of Jesus Christ – a gospel that demands a personal response of repentance and faith – a gospel that calls us to then proclaim that gospel to others – then that’s a different matter. In 1793, after continued government inaction on the construction of a promised church building, Mr Johnson built a church – largely with his own hands. It was big enough to hold 500 people and it opened on 25th August 1793, but – even though church attendance was supposed to be compulsory for all marines and convicts, on Christmas Day 1793, only thirty to forty attended. Major Grose decreed that the only church service in Sydney Town be at 6 o’clock in the morning – and he ordered the service be cut down to 45 minutes. Sometimes the soldiers were drunk, sometimes they were marched off halfway through the service. There was interference with Johnson’s ministry to the condemned, his convict workers were withdrawn, and river transport was refused for his frequent journeys to Parramatta. As well, soldiers and convicts were openly encouraged to treat him with contempt – and insults and stones were flung at him as he walked down the road. Tragically, the Colony descended further and further into the gutter as the Rum Corps took control. So there we have the three men– Johnson, Phillip, and Grose. One loved the gospel, one was indifferent, and one hated it and the man who proclaimed it. What shall I render unto the Lord for all his benefits to me? Against crushing opposition, Johnson did not give in. He kept on preaching the gospel, and showing love for all. Why? Because he was convinced that the gospel is the power of God for the salvation of everyone who believes. We can see how this godly Christian man sought to live out the text that he preaching at that first church service at Farm Cove. Out of gratitude for what the Lord has done for us, we too need to consider how we can show in our lives our thankfulness. Lest it be said that Johnson’s faith was only cerebral, academic, let’s notice some of the things he went on to be known for. Richard Johnson was, in fact, the pioneer of education in New South Wales. He was concerned for the education of all children – whether they belong to convicts or to freemen. By March 1792, he had set up schools on Sydney, Parramatta and on Norfolk Island. By 1798, the school in Sydney (which is also commemorated by a plaque in on the corner of Bligh and Hunter Streets) had 150 students. He was also responsible for the setting up of a fund to care for orphans, and when the Second Fleet arrived in Sydney with hundreds of sick and dying convicts on board, it was Johnson who went into the ships to care for those in need. Even more than that, he and his wife had a special desire to befriend the Aborigines – who were being dispossessed of their land by the white settlers. The Johnsons did a very symbolic thing, something overlooked by some modern historians. When their daughter was born in 1792, they gave her an Aboriginal name – Milbah. There’s a danger, when we consider how much Richard Johnson did during his 12 years in the Colony, that we might think of him as a mighty welfare worker… but that would be to miss the point. The reason he did what he did was the gospel. How would he want us to remember him? As I mentioned before, in 1792 he wrote a booklet, sent it to England to be printed and then sent back to be distributed here. It is is a wonderfully clear statement of the gospel. Johnson was a man who knew the the Lord Jesus Christ and who loved him and loved his gospel. And as a result, he worked tirelessly to do all within his power to present the news of Jesus to every man, woman and child. We know that there are people who think they don’t need the gospel – and there are others who are openly hostile. But, because of what the Lord has done for us, how can we be silent? Let us close with words from that first Chaplain to New South Wales, from the booklet he wrote to the people of our land. This will be my daily prayer to God for you. I shall pray for your eternal salvation, for your present welfare, for the preservation, peace, and prosperity of this colony: and especially for the more abundant and manifest success of the Redeemer’s cause and kingdom, and for the effusion and out-pouring of his Holy Spirit, not only here, but in every part of the habitable globe. Longing, hoping, and waiting for the dawn of that happy day, when the heathen shall be given to the Lord Jesus for his inheritance, and the uttermost parts of the earth for his possession: and when all the ends of the earth shall see, believe, and rejoice in the salvation of God (Ps. ii. 8 & xciii.3). 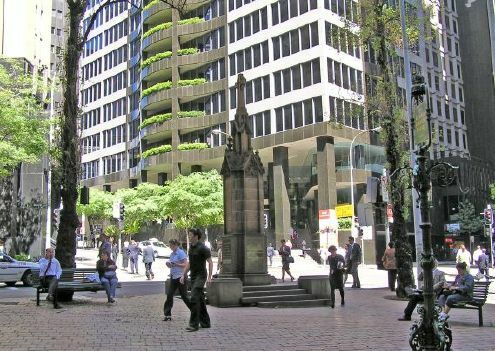 So, next time you are in the city, take the time to seek out Richard Johnson Square – on the corner of Bligh and Hunter Streets – and thank God for Richard Johnson – man of the gospel. Sir Marcus Loane’s wonderful book “Hewn from the Rock” is gratefully acknowledged as a source. Richard Johnson – The Background. ‘Go, bear the Saviour’s name to lands unknown’.